“What is Priestly Ordination?” The Rite of Ordination is what "makes" a man a priest. The Rite of Ordination occurs within the context of Holy Mass. After being called forward and presented to the assembly, the candidate is questioned and promises to diligently perform the duties of the Priesthood and to respect and obey his Ordinary (bishop or religious superior). Then the candidate lies prostrate before the altar, while the assembled faithful kneel and pray for the help of all the saints in the singing of the Litany of the Saints. The essential part of the rite is when the bishop silently lays his hands upon the candidate (followed by all priests present), before offering the consecratory prayer, addressed to God the Father, invoking the power of the Holy Spirit upon the man being ordained. After the consecratory prayer, the newly ordained is vested with the stole and chasuble and then the bishop anoints his hands with chrism oil before presenting him with the holy chalice and paten which he will use when presiding at the Eucharist. Following this, the gifts of bread and wine are brought forward and given to the new priest; then all the priests present concelebrate the Eucharist with the newly ordained taking the place of honor at the right of the bishop. The laying of hands of the priesthood is found in the Scriptures in 1 Timothy 4:14: “Do not neglect the gift you have, which was conferred on you through the prophetic word with the imposition of hands of the presbyterate." There are three main aspects to the priesthood: offering the Eucharist, hearing confessions, and counseling. Whilst continuing to hold the importance of these three aspects of the priesthood, the Church now has a significantly broader understanding. Priests are also responsible for daily recitation of the principal and minor offices of the Liturgy of the Hours. In addition to celebrating the Holy Sacrifice of the Mass, only priests can administer the Sacraments of Penance and Anointing of the Sick. The New Testament depicts Jesus as the "great High Priest” of the New Covenant who, instead of offering the ritual animal sacrifices prescribed by the Jewish Law, offered Himself on the Cross as the true and perfect sacrifice. The Catholic priesthood is a participation in this priesthood of Christ, and therefore traces its origins to Jesus Christ Himself. Thus, the New Testament says that as high priest, Jesus has made the Church "a kingdom of priests.” All who are baptized are given a share in the priesthood of Christ; that is, they are conformed to Christ and made capable of offering true worship and praise to God. The ministerial Catholic Priesthood has a distinct history. 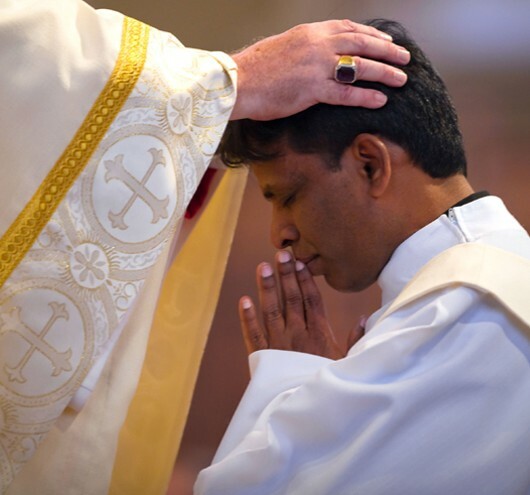 This ministerial priesthood involves the direct consecration of a man to Christ through the Sacrament of Holy Orders, so that he can act in the person of Christ for the sake of the Christian faithful, above all in dispensing the Sacraments. Christ instituted the Sacrament of Holy Orders at the Last Supper when He instituted the first Mass in the presence of the Twelve Apostles, commanding them to "do this in memory of me." The Catholic priesthood, therefore, is a share in the priesthood of Christ and traces its historical origins to the Twelve Apostles appointed by Christ. Those apostles in turn selected other men to succeed them as the bishops (episkopoi, Greek for "overseers") of the Christian communities. As the communities multiplied and grew in size, the bishops appointed more and more presbyters to preside at the Eucharist in place of the bishop. The diaconate evolved as the liturgical assistants of the bishop and his delegate for the administration of Church funds and programs for the poor. Today, the rank of "presbyter" is typically what one thinks of as a priest, although technically both a bishop and a presbyter are "priests" in the sense that they share in Christ's ministerial priesthood and offer sacrifice to God in the person of Christ. The Canon law of the Catholic Church holds that the priesthood is a sacred and perpetual vocational state, not just a profession (which is a reason for, and symbolized by, the state of celibacy). The seminary education to become a priest is extensive and lasts at least five or six years. In the United States, priests must have a four-year university degree in philosophy plus an additional four to five years of graduate-level seminary formation in theology with a focus on Biblical research. A Master of Divinity is the most common degree.